Educating in the 21st Century: 10 Reasons You Should Attend an Edcamp! 10 Reasons You Should Attend an Edcamp! 2. Hierarchies do not exist at an Edcamp. Regardless of his or her perspective, each participant's ideas and contributions are equally respected. 4. You'd like to ask a question, share your learning or initiate discussion about a particular topic related to education. 7. You enjoy talking with others who are passionate about education, most of whom you don't regularly interact with or may have never met before. 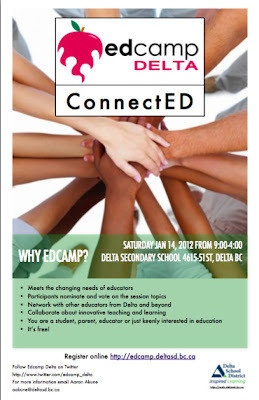 Edcamp Delta will be held on Saturday January 14th at Delta Secondary School. Perfectly put!!! Looking forward to Edcamp Delta, Edcamp Fraser Valley, and Edcamp 43 this year!!! Added to my bucket list: Attend an #edcamp outside the U.S. I've met so many passionate educators in and out of the U.S. via Twitter and Facebook.